I’m going old school for this dig. Django Reinhardt is a Jazz/Swing guitarist who had his hay day back in the 30’s and 40’s. When he was 18 he was caught in a fire and had severe burns all over his body. That accident paralyzed two of his fingers on his left hand, and forced him to re-learn how to play the guitar after his recovery. The amount of guitar playing he was able to re-learn is downright incredible. With his half of a left hand he still managed to become quite the accomplished musician. 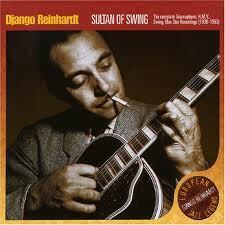 Spotify has tons of best of collections of Django and his quintet, and it makes for some great easy listening. The two most prominent members of the quintet are Django on the guitar, and Stephane Grappelli on the violin, so expect them to take most of the solos. I’ve only been able to listen to a small fraction of what they have on Spotify, it’s a disgustingly large amount of music, but it makes me appreciate Spotify even more. Where else are you going to find an endless collection of old timey jazz music? This entry was posted on Wednesday, April 3rd, 2013 at 2:51 pm	and posted in Acoustic, Jazz, Swing, Weekly Dig. You can follow any responses to this entry through the RSS 2.0 feed.